Making homemade broth is so easy to do, and the results are so wonderful and so almost infinitely useful, I really don’t understand why it’s almost disappeared from home cooking. Well, actually, I can guess: fewer and fewer people cook anything at all, let along things like homemade broth, which has an undeserved reputation for being difficult to make. Add to that the undeniable fact that broth takes time, something people seem to have less and less of. The truth is, broth is really easy to make at home and won’t put too much of a burden on your time. Except for the first few minutes, it can be left virtually unattended, simmering gently until it’s done. I usually start the broth on a lazy Sunday afternoon and just let it simmer while I read a good book, watch a movie or do whatever else I feel like around the house. When it’s done, just turn off the stove and leave it until you’re ready to eat, then reheat. The uses of broth are almost infinite. In Italian cookery, it is indispensable for many soups, of course, including the many pasta in brodo dishes, Risotto is infinitely better when made with homemade broth. But broth can go into any number of savory dishes to add greater depth of flavor. You may be surprised how much of a difference it makes! And don’t throw away the meats and veggies—they’re really good eating, too, as is, with some red or green sauce on the side, or ‘remade‘ in different ways. The essence of making broth is as simple as it gets: you boil meat—usually beef and/or chicken, but veal also makes a nice stock—with vegetables that, in Italian, they call odori because they are meant to provide flavor: onion, carrot and celery. (As I’ve mentioned often before, these are the same that are used for soffritto, the base for countless sauces, stews and soups.) To these basic flavorings, I often add a spring of parsley and/or a bay leaf, as well as a few whole black peppercorns and a clove or two. Step 5: Let the meat and vegetables simmer until the meat is quite tender and the broth has a rich flavor. The total simmering time depends on the meat being used: chicken will take an hour or two, depending on the type of chicken, while beef will take about three hours. If you’re using both and plan to eat the boiled meats, then you may want to remove the chicken so it does not completely overcook. The water should totally cover all the ingredients, so add more if the water reduces too much, as it will tend to do. Test for seasoning, and don’t be shy about adding generous amounts of salt. Broth should not be bland. NB: You can considerably reduce the time it takes for this step by using a pressure cooker. See notes below for details. Step 6: Once the meats are cooked and the broth has developed good flavor, switch off the heat and let the broth cool a bit. You can even let it rest on the stove (uncovered) overnight. You can also use the broth immediately if you like, but it has a deeper, richer flavor after this ‘rest’. 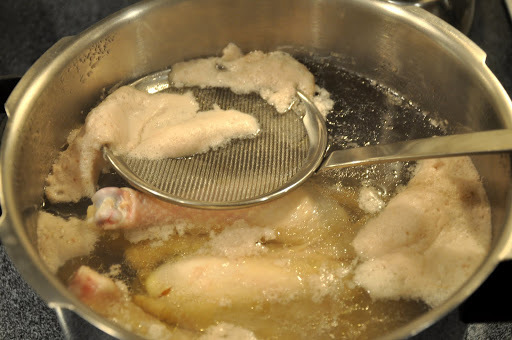 Step 7 (optional): If you want a clear broth –important when making a clear soup–strain the broth through the fine sieve or cheesecloth to remove the particles. (If you want a really clear broth, see note below.) If you wish to de-fat your broth, leave it in the fridge overnight; any fat will form a solid white layer on the top, which can then be easily removed. On the meat: If making a beef broth, use the same cuts of meat that you would for stewing or other long cooking. I love short ribs, but shank, brisket or chuck would all do fine. Adding a few marrow bones will add both flavor and a bit of body to the broth. Chicken is a bit tricky, especially in the States, as most of the chickens sold in US supermarkets are too young and bland to make a good broth from. However corny it might sound, a free-range, organic bird makes the best broth. A roaster is better than a fryer. Even better would be a stewing hen, if you can find one–if so, you’ll need to cook it much longer, up to three hours or perhaps longer. I have found a nice chicken, grown from Italian stock, that goes by the rather odd name of “Pollo Buono” or “Good Chicken”. Even though it appears to be a young chicken, it has rather firm but very flavorful flesh, which is great for making broth. When dealing with a regular supermarket chicken, however, truth be told, I sometimes cheat and add a bit of bouillon to boost the flavor. (I like the brand with the obnoxious name of “Better than Bouillon”.) My favorite broth is made from both beef and chicken, sometimes called brodo classico, or ‘classic broth’, in Italian . On using a pressure cooker: You can considerably reduce the cooking time by using a pressure cooker. Bring the broth up to pressure and let it cook for about an hour (for beef or ‘classic’ broth) or 30 minutes for chicken broth. Once you’re done, it will take some time to de-pressure on its own, so you can run the cooker under cold water to speed up the process. Since pressure cooking involved little or no evaporation, the broth will tend to be a little ‘thin’ unless you use less water than you would ordinarily do or (and I would recommend this in any event) you simmer the broth for another 20-30 minutes off pressure to concentrate the flavor. On clarifying the broth: If you want a really, really clear broth, after straining and de-fatting the broth, bring it slowly to a simmer while you add in the whites of several eggs (perhaps one per liter/quart) stirring all the while. The egg whites will eventually coagulate. By some process that remains mysterious to me, any impurities in the broth will cling to the egg whites, and you will be left with a perfectly clear broth, good enough for consomme or gelatin. Uses for homemade broth: Broth has an infinite number of uses. Really good broth is wonderful on its own, with some rice or small pasta like quadrucci or fine pasta like capelli d’angelo broken up into small lengths. It is also lovely with passatelli, a kind of string dumpling made with egg, cheese and bread crumbs. Broth with beaten egg mixed in until it coagulates is called stracciatella, or ‘torn apart’ soup (after the appearance of the eggs) and is a classic Roman dish. It is best to cook the pasta separately to avoid clouding the broth, then add it to the broth to simmer for just a few moments before serving. Broth is also a crucial ingredient in making risotto, in all kinds of soups, in sauces, in stews… you name it. And don’t throw out the meat. It makes wonderful eating, as a bollito (boiled dinner) either on its own with some salsa verde or rifatto in various ways. 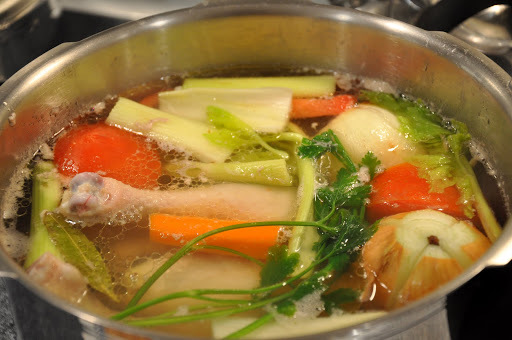 Broth vs. stock: Stock is made in same way as broth, except that you use only beef bones or the carcass of a chicken (or rabbit, duck or turkey) instead of pieces of meat. The bones or carcass are sometimes roasted in the oven before using to bolster their flavor. You can also the scraps from a leftover roast to make stock as well. Making stock is a great option if you have roasted a bird (say, a Thanksgiving Day turkey) and want to make the most out of your leftovers. But, of course, you will not wind up with any lesso to eat afterwards, and I find the taste not quite as rich as a homemade broth. Use stock in the same way you use broth. Keeping Broth: The traditional rule of thumb is that broth will keep for three days in the fridge. If you need or want to keep it longer, just reheat it until it just comes to the boil, let it cool and put it back in the fridge. Now, in my experience, you can keep broth a bit longer than that. If you have any doubts, taste just a little drop, if it tastes a bit sour, it’s gone off. Broth freezes well, although I have to admit, I generally find that frozen broth is less flavorful than the original. I usually make just enough broth for a week—Sunday afternoon is my broth making time—and reheat it mid-week to keep it from spoiling. Let the meat and vegetables simmer until the meat is quite tender and the broth has a rich flavor. The total simmering time depends on the meat being used: chicken will take an hour or two, depending on the type of chicken, while beef will take about three hours. If you're using both and plan to eat the boiled meats, then you may want to remove the chicken so it does not completely overcook. The water should totally cover all the ingredients, so add more if the water reduces too much, as it will tend to do. Test for seasoning, and don't be shy about adding generous amounts of salt. Broth should not be bland. Once the meats are cooked and the broth has developed good flavor, switch off the heat and let the broth cool a bit. You can even let it rest on the stove (uncovered) overnight. You can also use the broth immediately if you like, but it has a deeper, richer flavor after this 'rest'. (Optional): If you want a clear broth --important when making a clear soup--strain the broth through the fine sieve or cheesecloth to remove the particles. (If you want a really clear broth, see note below.) If you wish to de-fat your broth, leave it in the fridge overnight; any fat will form a solid white layer on the top, which can then be easily removed. – How long can broth keep in the refrigerator. – Do you deep freeze your broth in small containers and use a container or two as needed? Thanks and wish you happy holidays. weeks Dec 9 to Dec 23 with her three younger cousins who also speak English. You guys could meet, she loves to cook and is very funny (ha ha). Cheers. Ohhhh….in Romanian cuisine, a chicken soup with thin noodles is a ‘must be’ on each sunday table but an excellent dish for honoring guests also. With one exception: there isn’t any New Year dinner with chicken soup, only pork or fish. An old tradition of us… Great post , Sir ! I make chicken broth a lot – For me, roasting the chicken pieces before boiling it makes a huge difference in the amount of flavor. This makes the average grocery store chicken actually good for broth. Oh I feel like I can smell that delicious aroma just looking at the pictures! Thanks to all for your kind comments. Happy cooking! I'm with you! I can't imagine cooking without great broth, made at home. I can make them from all sorts of scraps and it would seem like such a waste to throw them away. thank, this is wonderful & VERY helpful. I usually use one or two of each vegetable no matter how much meat I'm using. For 1 lb., then I'd use one onion, one carrot and one stalk of celery. But there are no real rules for this. As far as water, yes, enough to cover the ingredients. If you are cooking under pressure, then just enough to cover. If you are using a regular pot, then enough to cover by 3-4 inches to allow for evaporation. This is great! I was actually going to ask my mother about her recipe, which is basically the same as the one you are using. I guess Spanish and Italian broth are very similar! One thing I missed was an indication about proportions: how much water? Just enough to cover? how many vegetables for e.g. 1 lb of meat? Excellent instructions and great pics!! Oh my gosh. You have officially made my day. Thanks oh so much! I love this! I love homemade broth and love to keep big batches in the deep freeze! I keep a thawed out mason jar filled with broth in the fridge and tend to use it in everything 🙂 Great post!! Italian style brodo is one of my favourite dishes, especially tortellini in brodo! thank you for sharing this! I like the pictures.